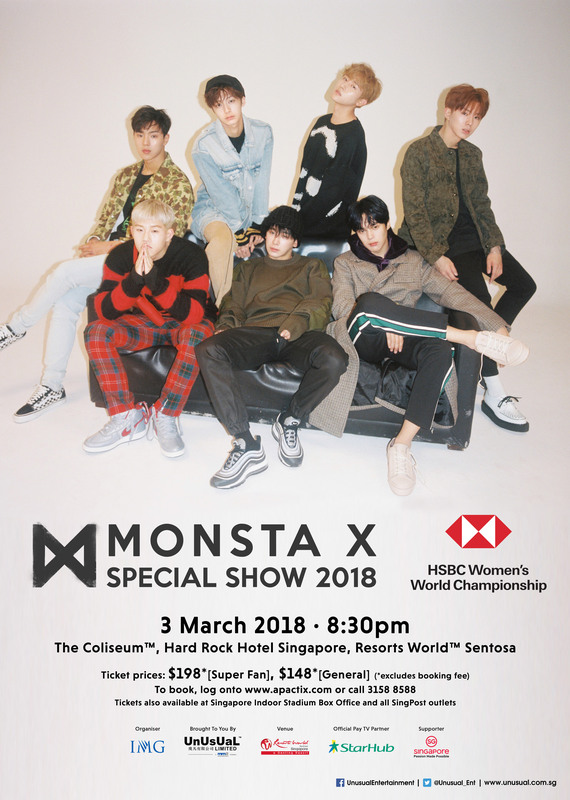 Singapore, 2018 – Popular K-pop Group, MONSTA X, will be the headlining act for HSBC Women’s World Championship Music Festival 2018, which will take place at The Coliseum Hard Rock Hotel Singapore, Resort World Sentosa on 3 March 2018. Public sale of tickets will commence on 25 January 2018 and tickets priced at $198* (Super Fan) and $148*, (*excluding $4 ticketing fee) will be available for purchase through all APACtix channels from 10am onwards. To book, log on to http://www.apactix.com or call +65 3158 8588. Tickets are also available at Singapore Indoor Stadium Box Office and all SingPost outlets. All HSBC Debit/Credit cardholders and StarHub customers will enjoy 10% discount. *Simply flash StarHub logo on your mobile devices or latest StarHub bill at Singapore Indoor Stadium Box Office or any Singpost outlet to purchase the tickets. All SUPER FAN ticket holders will be entitled to a lucky draw where they can win “Meet & Greet” passes to a group photo opportunity (200 winners) with MONSTA X. All category ticket holders will get a chance to meet MONSTA X up-close at the “High-Touch Session”. Please log-on to UnUsUaL Facebook page for details of “Meet & Greet” and “High-Touch Session”.